Aicon, an Italian Group based in Messina specializing in the design, construction and sale of luxury motoryachts and megayachts, would like to announce the presence of two new managers on its team: Fabrizio Pisciotta, Sales Director for the EMEA and ASIA-PACIFIC areas of Aicon S.p.A. and CEO of Aicon Yacht Europe Srl and Anton Andrea Speciale, CEO of Aicon Yachts Americas LLC. The Italian company confirms its leadership with orders for over $50 million in just five days at the Boat Show. The Miami Boat Show, was another big success for Azimut Yachts, the world-leading luxury yacht company. 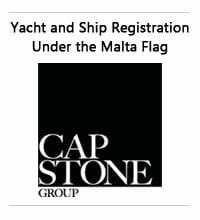 It was the 25th straight year that the Italian yacht builder was present at this important international event. At a time when the American yacht market is suffering a 3 percent contraction in the reference segment for Azimut Yachts, i.e. from 40’ to 80’ (lengths of 12-24m), the Italian company shows 10 percent growth. Azimut Yachts exhibited 12 boats in Miami, from the smallest Azimut, the 43Plus, presented here in world preview, to the company’s flagship, the Azimut 116. “Vivere”, the 35m megayacht built in the Viareggio yard to the exacting and detailed specifications dictated by the demanding and knowledgeable owner, was launched a few months ago in Manhattan beneath the Statue of Liberty. Bruno Abbate Primatist is consolidating is prime position in the international market, thanks to an excellent strategy that is showing itself the much desired successful results. The first 2008 quarter, in fact shows a + 35% for the boats ordered and a +37% respect to the same period for 2007. Important economic data reflecting the values that the new Arbatax site is having, now delivering its first finished boats for the prestigious brand. The Arbatax plant now offers Bruno Abbate the possibility to do the whole production cycle in a single area of 45.000 squared meters and a structure of 15.000, featuring latest high technology and quality equipment in order to give the best product available in the market. Canados, the Italian luxury motor yacht manufacturer and shipyard based in Ostia, Rome, is pleased to announce the appointment of Daniel Pagnoni as the new Chief Executive Officer of the company. He will be responsible for continuing the strategy of growing the company and the brand, both domestically and internationally. Daniel Pagnoni, 46 is an Italian national with a cosmopolitan background, who was most recently Senior Vice President and Global Category Officer, in Reckitt Benckiser, with operations in over 60 countries and market capitalization of approx. US $ 40 billion. He previously worked for Procter & Gamble and has a Master’s Degree in Industrial Engineering from Louisiana State University, USA. This young but very prolific builder completes its new yard the coming April after a year of hard work. The new space will have double building capacity compared to what it is at the moment, with space for up to 6 constructions together, divided for three 86 models, two for the upcoming 102 FlyingSport model and an area for a single build of 120feet, showing the future ambitions for Cerri. The new Cerri shipyard area will also have a new offices area, small hotel featuring 3 luxury fully fitted rooms for captains or special guests and also feature unheard standards for the workers with a luxury restaurant, swimming pool and gym all available for there use, showing special respect to the Cerri working team. The renowned White Turf, known throughout the world as championship races on snow, is an important annual international meet staged in St. Moritz on the first three Sundays of February. Since 1907, these horse races on the frozen lake have been an established tradition that sees noble thoroughbreds coming from all over Europe and international jockeys, offering an unparalleled social and sporting event, made even more unique by the majestic landscape of the Upper Engadine. Spread over 130,000 square meters, the frozen lake area accommodates the horse track, the 2,400-seat grandstands, and the elegant marquee, which includes refreshment stalls and the VIP tent, where figures from Europe’s cultural, economic, and political world congregate. CNL, as the leading company in the construction of alloy planning maxi yachts from 32 to 44 meters in length, with its Admiral brand, and renowned in the mega yacht world, chose to sponsor a White Turf race on the second Sunday of the meeting, highlighting Admiral Yacht Grand Prix along with the trotting race. The Admiral Yacht Grand Prix was particularly spectacular: it was an 1800 meter trotting race equaling a lap and a half of the track on a frozen surface, which is not a simple thing for a horse to accomplish. Special shoeing enabled thoroughbreds to move with agility even on such difficult ground, and sulkies were equipped with special skids in place of wheels. Melvin was the winner, a splendid thoroughbred driven by a woman, Evelyne Fankhausen. At the Award Ceremony, the young, visibly stirred victor received the Admiral trophy from the hands of Laura Ceccarelli, CNL vice president, and Francesco Ceccarelli, general director. Melvin’s owner and trainer were awarded a prize, while the horse received an elegant white shawl with Admiral Logo that was draped across its hindquarters by the Ceccarellis. Sport, fun, plenty of glamour and a company CNL Admiral, that is always able to astonish and inspire passion. The next Admiral Grand Prix at White Turf is set for next year. The Ferretti story began in 1968, when brothers Alessandro and Norberto Ferretti established their naval yard. It's an experience crowned by the achievement of extraordinary goals, created with passion, farsightedness and professionalism. These values have led the Ferretti Group to become what is today an international icon of Made in Italy luxury. In 2008 Ferretti celebrates the 40th anniversary of its foundation with a packed calendar of dates involving clients, the media, yards and local communities on an international level. Along with a number of special projects to be revealed in the second part of the year, 2008 will offer two main events. The first, next April, is "Privilege Days", an event dedicated to Owners of Ferretti yachts. On this occasion it will take place at a symbolic location for the yard, Cattolica, where is located the production site of the most prestigious models of the Ferretti Yachts fleet. On these special "Privilege Days" the Marina Nuova at Cattolica will host the entire Ferretti Yachts, Mochi Craft and Custom Line fleet, all completely open to visit for clients and prospects, offering them two unique, unforgettable days to experience the excellence Ferretti. The climax of the event is an exclusive dinner party for a limited number of guests at the Horses Riviera Resort. The end of the nautical year will be marked by a prestigious, internationally significant event: Ferretti is to celebrate its 40th anniversary with a unique performance, a private concert at The Teatro alla Scala in Milan dedicated to all those who have experienced, shared and contributed to the Company's success. Finally, a special celebratory logo has been created for all the activities involved in this exceptional occasion. Ferretti Custom Line the shipyard part of Ferretti Group and international leader in the production of composite maxi yachts between 26 and 34 metres, expresses its essence through the elegance and majesty of a new institutional film, blending images of its yachts with depictions of its Owners’ lifestyles. The film made by the Terminal production house was shot in 16mm in different Italian locations, from the Tuscan countryside to the Adriatic coast, the eternal grandeur of Rome, and the baroque interiors of the elegant villa de Vergers in Rimini. The unique quality that unifies these diverse settings is the personality of the Ferretti Custom Line Owner the real protagonist, together with the yachts that embody the fulfilment of a dream. Scenes from Owners’ lives are combined with cruising sequences where the details of the Ferretti Custom Line maxi yachts, are reflected in the expressions of protagonists, communicating awareness of themselves and their desires, distinctive style and refinement is revealed. According to the film director, Tiziano Campolmi, the Owner plays an active role in creating the beauty of his Ferretti Custom Line yacht, allowing it to become a breathtaking expression of his personality. The parallel with an oldtime tailor’s workshop is especially evocative; Ferretti Custom Line is like a tailor made suit for the Owner. Every model becomes a true masterpiece of uniqueness through its attention to detail, excellent quality, and the contribution of skilled master craftsmen. The outstanding Ferretti Custom Line maxi yachts are semicustomised, a unique feature of excellence. An architect from the shipyard meets with the owner, during the ship building process, to discuss several customization possibilities. All the parts not directly related to the yacht’s structure, starting from the décor, furniture precious woods, leathers, and fabrics, to furnishing complements can be selected amongst a wide array of choices, thanks to collaborations with the best Italian companies. The music of Pietro Mascagni’s “Cavalleria Rusticana”, create a background which produced a perfect blend between the uniqueness of Ferretti Custom Line maxi yachts, and the reliability, technology and prestige of the Ferretti Group. The video is online on the website homepage. From January 2008 on the family di Luggo, main shareholder of Fiart Mare, entered more directly in the management of the company. The Knight of work Ruggiero di Luggo stays president while Giancarlo di Luggo became CEO, together with Annalaura di Luggo as advising director for the commercial and marketing department. In fact, Giancarlo di Luggo will manage the company after years of managing experience in the financial and real estate business and replaces Fabrizio Brancaccio who remains in the board of directors as an adviser. The new managing director, 41 years old, married and father of 3 children, graduated with the maximum grades in Economy and Business at the University Federico II of Naples. For more than 15 years he has been running the real estate branch and constructions of the group Fiart Cantieri Italiani and LDB, companies of which he is the actual managing director. Today he accepts the challenge to contribute to the expansion of Fiart Mare, with the intention of being a breath of fresh to the company’s philosophy. He is carrying out this task by focusing on the distinctive characteristics of the company and the high quality of the product and concentrating decisively on the technology and the design of the range of products. Jet Aviation Palm Beach and Cavallino Classic magazine hosted their 7th annual La Bella Macchina event on January 25th, 2008. The event was a private cocktail reception and celebration of Ferraris, private aircraft, yachts and other rarities of life. More than 75 new, classic and vintage Ferraris were on display, including some rare editions, and this year boasted the introduction of the Ferrari 599 GTB for the first time in South Florida. Among the other luxury brands partners of the event, Riva put at disposal of the attendees an exemplar of Aquariva. Guests, among whom hundreds of Ferrari owners, Palm Beach and New York socialites and premier business people, had the chance to admire and to tour the Riva 33 footer that, thanks to its pure and elegant design, is already considered a classic from worldwide collectors. Sealine International is delighted to announce the appointment of Seascape Media as the official publishers of its biannual customer magazine. Designed to capture the personality of the Sealine brand and to reflect the lifestyle associated with owning a luxury motorboat, the new ‘Sealine Magazine’, which replaces the former ‘Instinct’ publication, will be a glossy lifestyle title. It will include features on a wide range of subjects from inspirational real life adventures, on board living to beautiful cruising destinations. 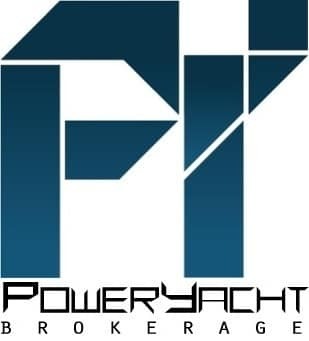 It will be published in March and September and has exclusive distribution rights via the company’s dealer network and at international boat shows. It will also be distributed direct to Sealine owners in the UK. The Sunseeker Charitable Thrust was delighted to presenting two separate cheques to both the Starlight Children Foundation and CLIC Sargent (Caring for Children with Cancer) at the London Boat Show on 20th January. The Thrust has contributed 50.000 UK Pound to both institutes in order to support a worthwhile cause and help make a difference. Viking’s 11th Annual VIP Boat Show Preview held February 1-2, 2008 at the Viking Yacht Service Center in Riviera Beach, Florida, attracted a crowd of 600 enthusiastic Viking owners and friends. Beautiful weather abounded as an impressive fleet of new Viking yachts ruled the seas during two days of nonstop sea trials. For many of the attendees, the event marked their initial viewing of the Viking 60 Convertible, the Viking 60 Enclosed Bridge Convertible and the spectacular new Viking 50 Convertible. 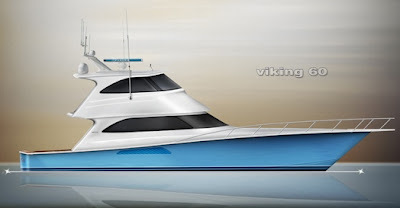 The VIP Preview takes place just prior to the Miami Boat Show and showcases the entire Viking product line from 45 to 74 feet, as well as the superb Service Center facility. In addition, we invite a select group of important Viking vendors and suppliers to participate. They provide a boat show like environment with informative displays of marine equipment, engines, accessories and other services. This year’s event also marked the opening of the nearby Viking International Yacht Center, an expansive waterfront facility that has become the new home for Palm Beach Towers and Atlantic Marine Electronics. The fight for the 2008 WPPA Class 1 World Powerboat Championship looks set to be the most fiercely and openly contested for almost a decade. Of the ten boats that will challenge for the title this season, nine will field new driver pairings, with two new teams and three new drivers set to make their Class 1 debuts. Victory will line up for the season opener, the Qatar Grand Prix, in Doha coming Saturday, 1st March to start the defence of their World title with Arif Saif Al Zafeen and Jean-Marc Sanchez, the 2007 World and European Champions facing each other as team-rivals. Al Zafeen will run with the prestigious number one plate in Victory 1 and partnered by Nadir Bin Hendi, whilst throttle man Sanchez, who for the second year in a row is tasked with guiding and developing the talents of the latest recruit to the Victory camp, Class 1 rookie, Abdullah Al Mehairbi, in Victory 7. If there is pressure on Victory to successfully defend their titles this season – there is possibly greater pressure on Sheikh Hassan to try and deliver Qatar’s first world crown, and who will come under intense scrutiny to see how he performs in Qatar 96, the ex Spirit of Norway 10 alongside the teams ‘new boy’ Steve Curtis and in the boat that he won four of his eight world titles. Sheikh Hassan’s former throttleman Matteo Nicolini takes over the sticks in Qatar 95 alongside Abdullah Al-Sulaiti to rekindle a tried and tested partnership that knows each other well having raced together winning the Class 3, 6 litre World and GCC Championships and who will be formidable adversaries, especially with both Qatar outfits running the Skema, V12 power-plants. Europe’s challenge to the might of the Middle East, as well as the challenge to try to break the dominance of the V12 engines, will be headed by Negotiator, the only outfit in 2008 to field an unchanged line-up, with Chris Parsonage and Bard Eker looking to build on their strong second half season-showing in 2007, and hoping to reap the rewards of a full season behind them developing the Sterling Supercharged V8s. A new-look for Jotun sees Bjorge Jacobsen taking the wheel in Doha, a role he will share with Class 1 newcomer Inge Brigt Aarbakke over the course of the season to partner Jorn Tandberg, with the team running an improved Mercury-Class 1, V8 engine set-up and bringing in American Jon Maas as Crew Chief in an effort to cure the reliability issues that thwarted Jotun’s 2007 campaign. Giorgioffshore will start 2008 with renewed optimism and fully confident that they will deliver a new level of performance, replacing their Cougar and running a Michael Peters-designed, Victory hull powered by Giorgioffshore V12s, with Giorgio Manuzzi, who made his Class 1 debut at the Egyptian Grand Prix last year, taking the wheel to partner Nicola Giorgi in SeveneleveN. Giampaolo Montavoci also starts 2008 with a new wheel-man, Norwegian, Kolbjorn Selmer, who also made his Class 1 debut last year, joining him in Foresti & Suardi. But it is likely that the pair, who have raced together twice before will kick-off their season in the number two boat, the favoured boat currently undergoing modifications in Italy. New outfit Team One is expected to make its first appearance in the Championship in Doha, with Italian Lino di Biase being touted as the likely throttleman and Frenchman, Jerome Brarda in the frame to take the drivers seat, but the new all-Spanish team being brought together by Domenico Cirilli are likely to start their season at the second race of the year, the Montenegrin Grand Prix in Budva. Astondoa continues to extend it's range of fabulous yachts and cruisers, presenting the new open range flagship with the new AS 67 Open, launched during the 2007 Barcelona Boat Show along two other new flybridge releases, which we have already presented on PowerYacht. Continuing the philosophy of the recent new models, the AS 67 Open is designed by Italian Christian Gatto, who presented an elegant yet aggressive looking sport yacht. The new Spanish built 67 footer sport yacht does not only offer great looks outside, but also a very welcoming interior with a well planned 3 cabin layout featuring a full beam mid-ship owners suite with big integrated large windows for maximum natural light, well sized galley to port en-route to the lower deck accommodation which is something missing in many of the large opens in the market today and also an optional crew cabin forward. Performance for the AS 67 Open which has exterior looks calling speed, can go to a maximum of 47 knots with the bigger MAN 1360 hp engines option and surface drive propulsion. The Posillipo 65 Technema is the smallest offer from this renowned builder and was presented during the 2002 Genova Boat Show. This model follows the family feeling for this historical Italian brand, with the inimitable Technema hull and it's particular wings and a conservative yet modern superstructure based on the lines of the 70 and 80 models, designed by renowned architect Giovanni Zuccon. It replaced previous 67 Technema in production from 1994 to 2000, which was the first new unit produced by Gianfranco Rizzardi after the take over of Posillipo in 1993. The smallest of the Technema models has just one duty in it's mind, offering maximum space and comfort in a luxury appointed 3 cabins interior for the owner and his guests delivering the best in spacious environments and comfortable cabins. The interiors follow what is today a common layout with owners cabin located mid ship, VIP cabin forward and the third guest cabin with two single berths located to starboard in between. All cabins are equipped with there own en-suite heads, with particular spaciousness and superior size for the master and VIP cabin with both featuring a bidet but also a separate shower. A separate 2 berth crew cabin is located forward for maximum privacy for the guests and crew. The living area of the 65 is also equipped of what is an area of high comfort in a classic two floor area. A big c-shaped saloon fully equipped for socializing and entertainment welcomes you to the inside of the motor yacht, while a second c-shaped settee located forward to starboard of the main deck is the dining area which is joined to port by the main interior helm station. The galley on the standard version is a separate offer as preferred by Southern European clients, but if preferred it can be ordered in an open layout. The exterior spaces offer a spacious aft deck giving the feeling of a much bigger boat, as do the deep all around side decks. The flybridge area has a spacious c-shaped dining area for Al-fresco dining while a 2 person medium sized sunbed is located forward of the settee to port. While the showed plans offer the standard layout, Posillipo offers a high range of customization and can be ordered to request unlike most of the competition in this size range. The Technema hull is renowned for superior sea keeping standards over other deep vee shapes, and is a status symbol of Italian design being introduced by Posillipo in the early eighties with aggressive profiles accentuated by the stylish wings which give a particular dry ride without the need of a high ride. The 65 Technema hull shape is a deep vee, with a 13 degrees aft dead rise offering distinctive performance with top speeds of 33 knots and a continuous cruising of 28 knots, giving a range of 330 nautical miles with the bigger engines option. High competition in this size range, showing just how much demand has been growing. If one had to look back ten, fifteen years you would have had a smaller and different builders list with only Italians and USA builders. One thing striking tough is how much the Italian influence shows up in this size, not only as the main brands for this type of yachts but also the design influence they have had over the years. It is really clear to passionate people who have a certain experience to them, just how much the Italian design shows up, with the little exclusion being for the Hatteras 64. The Posillipo 65 Technema really ticks the boxes where it matters most, with generous performance and a bigger boat feel which is for sure one of it's higher selling criteria. Surely it is not the most innovative motor yacht in the twenty metre range, but Posillipo yacht buyers are usually the type of experienced yachtsman who have seen it all and done most, and are more looking for a timeless classic conservative design that is out of the actual fashion schemes and does not feel dated after the next fashion trend. Picture Copyright Posillipo. Data Posillipo. 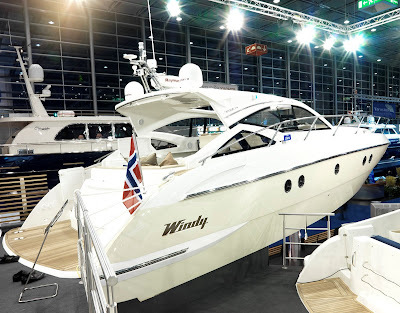 Taking centre stage on the Windy stand during the Düsseldorf Boat Show was the stunning new Windy 44 Chinook luxury sports cruiser, which made its worldwide debut at the show. The latest model from the renowned Norwegian boatyard is a handsome hard-top, designed with families who are not willing to sacrifice style and performance for space and comfort. Inspired by the success of the Windy 37 Grand Mistral, with its big, sociable cockpit, the 44 Chinook’s extra beam and length allows room for a spacious saloon and three double cabins below. Add a top speed of 38 knots, good looks, and the superb build-quality that has become standard with the Windy brand, and you have a hard-top sports cruiser that delivers on every count. Accommodation wise, too, the boat is in a class of its own. The enormous U-shaped sofa in the cockpit will sit the whole family and several friends comfortably. And it’s a similar story down below, with a big L-shaped dinette and a well-equipped galley with a huge floor space in between. Moreover, the Chinook is the among the few boats in this size to offer three double cabins: a big owner’s double cabin in the bows, with ensuite heads and shower, and two separate, roomy doubles amidships, which share heads on the starboard side. For all its elegant styling, and carefully considered accommodation, the Windy Chinook is designed to perform. The boat has an uncompromising deep-V hull to iron out rough seas, and comes with two engine options: twin 370hp Volvo diesels with Duoprop outdrives, or twin 435hp Volvos with forward-facing IPS drives. Top speed is estimated at no less than 38 knots, with cruising at 34 knots. Project of the new Sealine SC 47 follows the modern design and innovation the British builder showed for the SC 35 presented at the 2007 Southampton Boat Show. The World renowned manufacterer seems ready to put a minimal design approach to its sports cruiser range and the new 47 seems to be the next model to be presented aiming to this style direction. Curious enough Sealine was among the first builders going to the curved integrated design in the early nineties, which has made it enjoy huge success especially with clients looking for a lot space into the size. Seems the builder believes minimal is the next step in the boating trends, both inside and outside. The new SC 47 is a 2 cabin sports cruiser with 2 heads, offering one of the most spacious full beam owner's cabin in this size range. The cockpit is completely covered, shaded space with the hard top close or open to the sun if one would desire, and offers a spacious C-shaped settee, L-shaped wet bar and a sun pad to the left of the helm station located to starboard. The Innovoazioni e Progetti 48 Alena is the synthesis of practice, comfort and high performance this builder had us used to in the last years. This new model from the Italian builder is based on latest propulsion assured by Volvo Penta engines with IPS pod drive units. The new Volvo IPS is a complete electronic system involving steering, controls, instruments, engines, propulsion groups and thrusters' together allowing better low speed handling but also a superior performance already at low speeds. 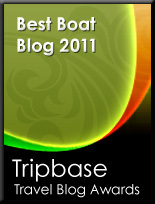 The efficiency of this system allows more comfort on board thanks to reduced space being used for the heart of the boat and superior safety standards if one had a bad experience crashing into sea grounds as the detachment of the transmissions occurs in arranged breaking points, reducing to minimum the risk of a hull's breakage. The interior of the new 48 Alena enjoys a comfortable family layout of 3 double cabins, with very spacious heads and a fully weather protected entertainment area with galley on the main deck. The Alena 48 has also the bonus of being one of the few 3 cabins, 14 meters in the market having a patio door separating the saloon from the cockpit when the weather does not look good. Viking has been building enclosed bridge convertibles for over 11 years, delivering the first model, a 58 EB in the summer of 1995. As the design has evolved over the years, Viking now offers enclosed bridges on the 74, 68, 64, 56 and now the new 60. Although the size of the enclosed bridge varies depending upon the model, each one shares a commonality of luxury and convenience features. To maximize visibility, the helm is moved forward on centerline and each of three tinted windshield sections is fitted with a wiper and washer. The dash is wrapped in black ultra-leather to reduce glare and serves as the ideal location for electronic displays and the flush-mounted compass. Overhead, a bank of accessory switches controls various systems. Single lever controls supplied by the engine manufacturer and a vertical destroyer-type wheel with power assisted hydraulic steering deliver instant response. An adjustable Stidd helm chair provides plenty of comfort for long range excursions and on most models is flanked with upholstered companion seats, each with a sturdy footrest. Abaft the helm is essentially a second salon with similar amenities found below. A plush J-shaped lounge with stowage underneath on a raised platform allows guests panoramic views through the forward, side and aft windows, which totally eliminates any sense of confinement. A cocktail table adds a nice, convenient touch. Opposite the lounge, the hand-finished teak cabinetry houses a refrigerator with space available for bottle stowage and a sink. For entertainment, a flat-screen television, stereo and CD player are standard. The enclosed bridge is fully air conditioned and in reverse cycle mode, the system can supply heat for those chilly days at the beginning and end of the season. In fact, it is this feature of the enclosed bridge that many owners appreciate because it allows them to extend their boating season and enjoy more time on the water. On those in-between days, you can open the overhead hatch and the weatherproof exterior door to invite plenty of fresh air aboard. Another useful benefit of the design is it provides for an interior staircase from the salon so that during inclement weather, there is no need to travel outside to reach the flybridge. For docking ease, each enclosed bridge model is equipped with an outside aft docking station. The controls and wheel fit neatly into a fiberglass helm pod with room to add some electronics if desired. Opposite the outside helm, there is a molded fiberglass seat topped with a plump cushion for comfort and plenty of stowage below. On enclosed bridge models, all of the flybridge railings, including the bridge ladders are powder-coated to blend in nicely with the surroundings. Even the quartz lights, which illuminate the cockpit, are ensconced in fiberglass pods for a totally finished look. Viking also offers an option called the skybridge. This feature is a cozy open flybridge that sits atop the enclosed bridge roof. If it is extra height you are looking for aboard your next new Viking, it’s safe to say the sky is the limit with this accessory. Viking’s Enclosed Bridge Convertible line-up is one more example of our commitment to build a better boat everyday. They are the consummate cruising yacht, yet are fully capable of fishing alongside our Open Bridge boats. Turkish builder Numarine presents the much awaited 55 Hardtop model, a fast offshore boat based on the aggressive lines of the successful 55 Open model. With the 55 Hardtop, Numarine adds another addition to the 55 feet range, now being offered in 4 different versions including this new much requested hard top design. The Turkish builder did not stop on the outside and also redesigned the interior space now offering a minimal design approach with a spacious 3 cabin layout, featuring a wider VIP cabin located mid ship and a modern integrated saloon area with galley wet bar located to port and a c-shaped saloon settee to starboard. Engines options are latest Caterpillar of 575 and 715hp each, giving a very respectable top speed of 38 knots with the most powerful units. The new Numarine 55 Hardtop is also certified with latest CE B rules and has an interesting price quality offer. Starting on the 14th and closing the 18th of February is the second most important boat show of the USA, the Miami Boat Show, known for it's versatility offering boats of all types and sizes from the little 15 foot runabout up to 85 feet Super Yacht in three different areas. The Miami Show offers visitors and all round attention concentrating its attention to the smaller sizes without forgetting the bigger ones. 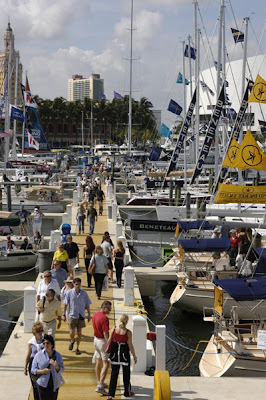 The three areas of the show are the following: Miami Beach Convention Center which shows all the best in Power boats of various sizes and types, Sea Isle Marina also dedicated to power boats with an attention to the Sport Fisherman style of boat and the bonus of some of the boats available for sea trial and last the Mia Marina Bayside area dedicated to sail, but also conventions and parties. The announced World firsts at this year show is the much awaited Hatteras 56 Motor Yacht, Marquis 500 SC and 70 which features a third raised saloon pilot house area and the Viking 60 Enclosed Bridge on the base of the Convertible model presented in Fort Lauderdale last October. Other important musts, dos and see is hull no.2 of the Magnum 80 which is like another premier as is anything coming from this legendary builder. 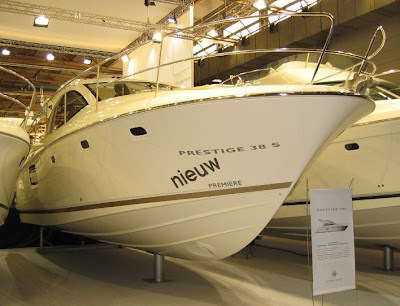 The Jeanneau 38 Prestige S launched during the 2008 London boat show has been among the most expected new boats in this size offer. Italian designers Garroni present a real class leader in this size with innovative hardtop outside lines, big mid cabin window and a very versatile modular cockpit area. The main deck outside cockpit area is really the heart of any sports cruiser especially in the 11 meter size. Jeanneau really had a global thinking offering a versatile transformable outside with 2 different options as the circumstances may require. if you use your boat in the North colder climates a 2 shaped settee is the one for you, but when the sun gets going the aft part can easily transform in a spacious sun deck for the aft area. The French builder has also found the space to include a tender garage under the sundeck or settee as it is at the moment. The inside of the Jeanneau continues to surprise as it is a spacious versatile 2 cabin layout with a huge wardrobe for the forward located owner cabin and a transformable 2 singles or double guest cabin mid ship. Hull design for the 38 Prestige S is by offshore winning designer Michael Peters and propulsion is a pair of latest Cummins QSD 4.2 at 320hp each. The long awaited Elan Power 48 was launched at the Boot Dusseldorf, Germany to a huge response from brand fans and from clients looking at this size and type of sports cruiser. New flagship of the Elan Power range the new 48, is an elegant and stunning hard top sports cruiser with luxury interiors setting new standards in this size and range. Tony Castro designed a much diversified hard top model for the Slovenian builder, with options of 2 or 3 cabin interiors, with the 3 cabin version having a single saloon up top under the hard top. Engine options are latest shaft driven Volvo engines of 500 or 575hp each. Aussie builder Riviera announces the new Riviera 38 Open Flybridge, a two-cabin, one bathroom model, developing the millennium styling introduced in 2000. The saloon on the new Riviera 38 continues the sense of light and space seen on latest Riviera flybridge models with a conveniently low located galley in the saloon lounge area, ensuring flow of natural light. With a low profile flybridge hardtop Riviera uses light RTM (Resin Transfer Moulding) manufacturing techniques, ensuring light weight combined with strength. Up top on the flybridge a comfortable high-back helm seat is inboard with companion seat outboard and set slightly back with plenty of room behind the helm chair for easy access. A new style dash console has been integrated into the helm station offering a clean, robust look with complete engine monitoring displays and navigation instruments. A lounge stretching in front of the helm easily accommodates three adult guests. Externally, the new Riviera continues the evolutionary styling, with tinted glass windscreen panels fitting together in front of the windscreen mullions to give a modern all-glass look. Below decks accommodation includes two cabins: a master stateroom forward with walk-around queen double bed, a two doors entrance bathroom one from the master stateroom and one from the companionway and the second guest cabin with two spacious bunk berths. The spacious bathroom features satin chrome fittings and shower pole as well as a solid surface bench-top. Twin Volvo turbo diesel engines rated at 370hp each are the standard power on the new Riviera 38 Open Flybridge. The Alicante Shipyard presents the 3 Doma in the new Avante version. Avante in this case meaning for a hard top offering an alternative all weather sports cruiser, but still retaining the rounded sporty lines which have made this models a success for the young Spanish builder. 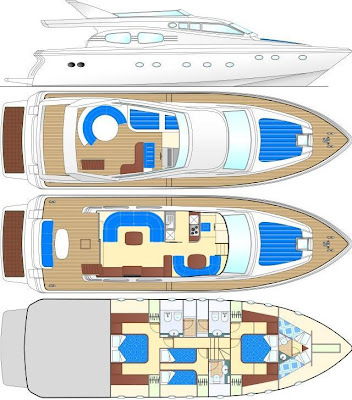 This new hard top version for this 39 feet of length overall sports cruiser shows the versatility the Spanish builder wants to make, not only by offering a huge range of colors and interior options to the future owners but also by creating another alternative model to the 3 Doma in the Avante version. The Alicante Doma 3 Avante retains the spaciousness of the normal version of a spacious 2 cabin interior with a nice L-shaped saloon to port, a well sized L-shaped galley also to port and a very spacious shower head. Outside it retains the very alternative cockpit with loads of seating space, 2 spacious sun beds aft and another solarium forward on deck. Performance is a fast 41 knots with the big double 370hp Volvo D6 option. The new Riva 92 Duchessa project follows the successful 115 Athena, flagship of the fleet since 2005. Riva continues its adventure in the mega yacht segment, with a new, refined model with curved, racy lines with a harmonious design of the profile. The new mega yacht encloses all the elegance and inimitable Riva style, as always in a solution featuring a unique, original design. Mauro Micheli's pencil, the work of his team at Officina Italiana Design and Riva's Engineering Department have once again managed to sketch a winning yacht. The novelties are numerous, both in the exterior design and in the interior layout and fittings, that won't miss to match the requests of the most demanding owners. The new, refined jewel has been added to the Riva collection, which currently features twelve models, and will be on display in September at the 2008 Cannes Boat Show. 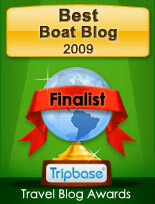 Launched in Summer 2007 this picnic styled power boat was brought to my attention in the lively web forum at YBW.com. Maxi Dolphin is a renowned sailing yacht builder who decided to build its first power boat, a 51 feet model with classic and elegant lines. Its clean design disguises its apparel, designed to reward maximum sailing comfort and enjoyment. With the 51 Power, Maxi Dolphin offers a day cruiser but also a stylish maxi tender for the mega yacht, suited for day-outings at sea with family and friends or for brief cruises of a day or two. Below decks there is a large owner’s suite with private bathroom and shower, plus an adjoining spacious dinette, saloon and small day head. Power is provided by latest technology Volvo IPS 600 Pod drives of 370 hp each, giving a maximum speed of 38 knots and long cruising of 30 knots.